A group of Anne Arundel Community College volunteers and community members donned their gardening gloves for a third consecutive year to beautify the Glen Burnie Town Center by planting a tree, shrubs, 400 perennials and annual flowers in a flower bed and a dozen planters. Unity Gardens awarded AACC a $1,000 grant to cover the cost of plant material and mulch. The grant award was to the AACC Professional and Support Staff Organization Community Service Committee and AACC Foundation Inc.
AACC has classrooms, offices and student services at the GBTC Arundel Center North; the center is also home to the college Hotel, Culinary Arts and Tourism Institute kitchens and classrooms. The volunteers planted several native species – a Cercis Canadensis “Redbud” Tree, five Inkberry bushes, 10 Black-Eyed Susan perennials and non-native species: five Knockout rose bushes, 10 hosta and assorted annual flowers in a planting bed beside the parking garage and in a dozen planters. Volunteers were members of the Community Service Committee, AACC students, AACC staff at the Glen Burnie Town Center, grandchildren and a community resident. 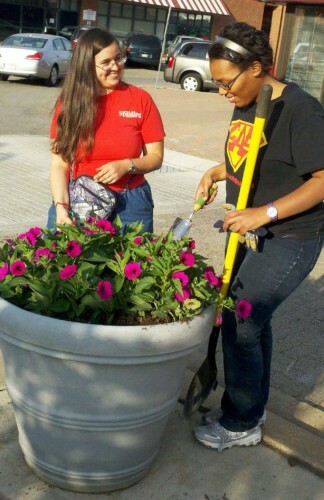 Courtesy Photo: Anne Arundel Community College students Melissa Dittmar of Severna Park (left) and Julia Keith of Pasadena were among community volunteers who assisted with the greening up of the Glen Burnie Town Center. Unity Gardens awarded AACC a $1,000 grant to cover the cost of plant material and mulch.